I am starting a T-shirt business that will have words and quotes or slogans that will make you think. I am looking to have a logo designed for the business and the shirts. 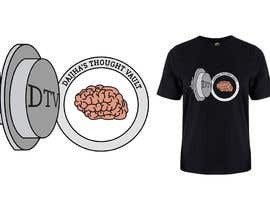 The name of the business is Daijha's Thought Vault. I envision the logo to have a vault that looks like a brain with the letters DTV in there somewhere. The vault does not necessarily have to look like a brain but I want it to have a brain, vault and DTV and maybe a question mark incorporated into the logo. please sir check my logo #8, I hope this logo is perfect for you.